As I’ve pointed out before, the big difference between the United States and Europe is not taxes on the rich. We both impose similar tax burden on high-income taxpayers, though Europeans are more likely to collect revenue from the rich with higher income tax rates and the U.S. gets a greater share of revenue from upper-income taxpayers with double taxation on interest, dividends, and capital gains (we also have a very punitive corporate tax system, though it doesn’t collect that much revenue). The real difference between America and Europe is that America has a far lower tax burden on lower- and middle-income taxpayers. Tax rates in Europe, particularly the top rate, tend to take effect at much lower levels of income. European governments all levy onerous value-added taxes that raise costs for all consumers. Payroll tax burdens in many European nations are significantly higher than in the United States. This makes for interesting cross-border comparisons, but it also raises an overlooked point about political attitudes. Why are leftists so hostile to successful people? Think about it this way. If a farmer has five cows but one of the cows produces most of his milk, at the very least he would treat that cow with great care and concern. Left-wing politicians in the United States, by contrast, express contempt and disdain for the upper-income taxpayers who finance our welfare state. The invaluable Mark Perry of the American Enterprise Institute points out that the top-20 percent bear the lion’s share of the fiscal burden in the United States. CBO provides detailed data on American households for each income quintile in 2013 for: a) average household “market income”(includes labor income, business income, income from capital gains, and retirement/pension income), b)average household transfer payments (payments and benefits from federal, state and local governments including Social Security, Medicare, Medicaid, unemployment insurance, and Supplemental Nutrition Assistance Program (SNAP)), and c) average federal taxes paid by households (including income, payroll, corporate, and excise taxes). Mark presents that data in an easy-to-understand format and highlights the relevant numbers in red. The key takeaway is that the top-20 percent basically finance our Leviathan. To make the issue even clearer, Mark created a chart showing the data from the sixth line in the above table. 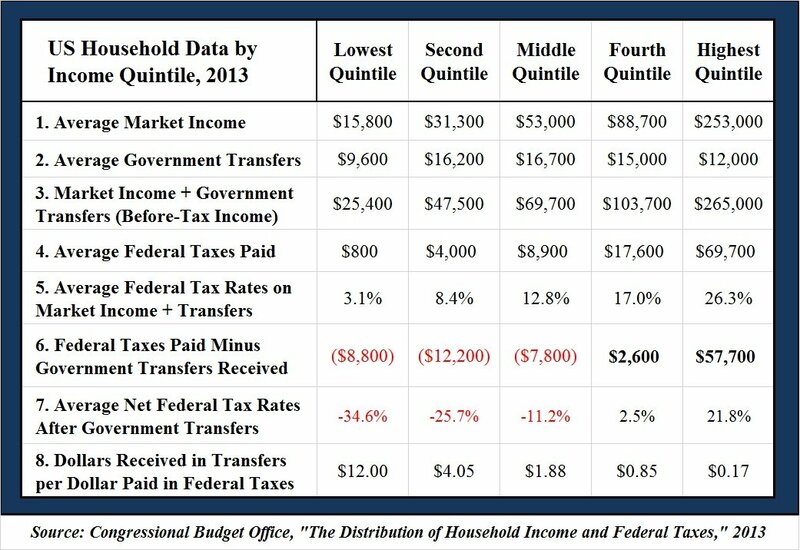 Again, the only possible conclusion to reach is that higher-income households are the net financiers of big government. Now let’s augment Mark’s analysis by examining some research from Scott Greenberg and John Olson of the Tax Foundation. They also review the new CBO numbers and their focus in the tax burden on the top-1 percent (i.e., people who actually are rich). One of the main takeaways from this year’s report is that the richest Americans pay a lot in taxes. In 2013, the top 1 percent of households paid an average of 34.0 percent of their income in federal taxes. 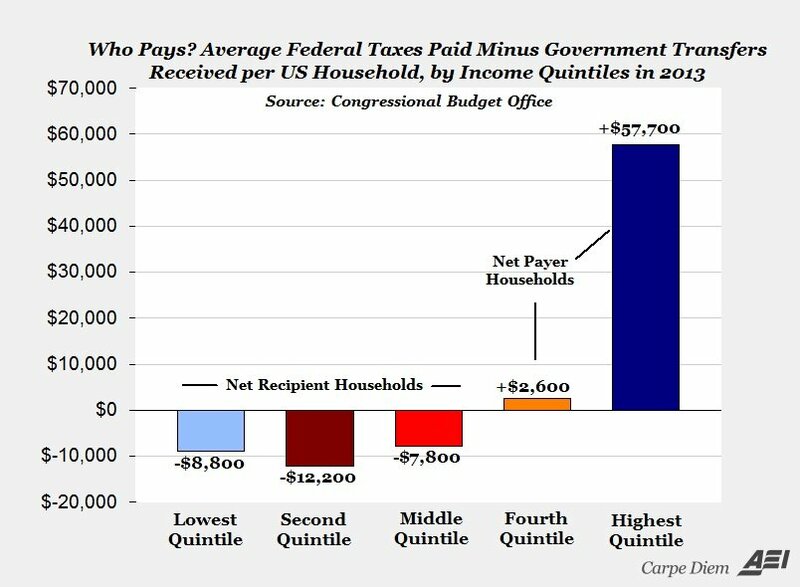 To compare, the middle 20 percent of households paid only 12.8 percent of their income in taxes. 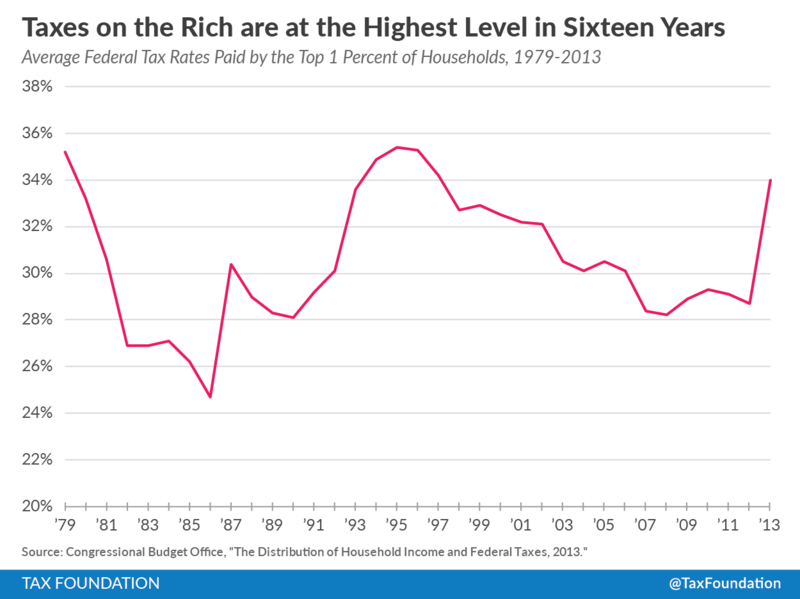 Moreover, taxes on the rich are much higher than they’ve been in recent years. …in 2013, the top 1 percent of taxpayers paid a higher tax rate (34.0 percent) than in the year President Reagan took office (33.2 percent). And here’s the chart accompanying their analysis. There are all sorts of interesting stories inside this graph, such as the interaction of capital gains taxes and stock market performance (the top-1 percent tend to be significant investors). There are also interesting stories that aren’t captured by this graph, such as the fact that rich people have great ability to adjust their taxable income when tax rates climb and fall (which was one of the reasons rich people paid a lot more tax when Reagan dropped the top tax rate from 70 percent to 28 percent). Also, the average tax rate is less important than marginal tax rates if you want to understand how much damage the tax code imposes on the economy. But for our purposes today, all that matters is that rich people over the past several decades have coughed up, on average, about 31 percent of their income to Uncle Sam. That’s a lot of money. In effect, the federal government gets a dividend when successful taxpayers earn money. Which brings us back to the perplexing fact that leftists have nothing but scorn for the folks who finance the welfare state. Indeed, some statists have so much contempt for successful people that they want to push tax rates to high that the rich no longer would want to earn additional money. Which means, of course, that the IRS wouldn’t be collecting any money. I don’t know whether the right metaphor is a farmer abusing the cow that produces most of the milk or a shareholder who sabotages the company paying good dividends, but the only possible conclusion is that leftists hate rich people more than they like big government. If you think I’m exaggerating and such people don’t exist, watch this video – especially beginning about the 4:30 mark. P.S. To be fair, leftists don’t hate all rich people. They’re willing to shower bailouts, subsidies, and handouts on wealthy people who give them lots of campaign contributions. on February 24, 2017 at 5:59 pm Which Country Punishes Productive People The Most? | Daily News Inc. Try explaining this to liberals. Of course, this explanation would fall on deaf ears. Now, the Left would never understand this. All they would do is beef about the rich not paying their fair share in taxes. Wealthy people finance the welfare state. Even under the current effort-reward curves, Americans seem to have already settled into an average two percent annual growth trendline. Though this is higher than Europe, it is still half the world average. It is still an arithmetically deterministic trajectory to decline, albeit at a somewhat slower pace than Europe. So while Europeans, under their current growth trendline (about one percent annually) will be reached (and absorbed by) the middle income country group by mid century, America will not reach that fate until one or two decades later. Of course, things will get bad way before absorption into the middle income country group. None of this will be a pleasant ride — in case you have not already noticed. So this decline is what will already happen under existing effort-reward curves — in other words, that is the decline trajectory that is ALREADY baked in the cake under the current American effort-reward curves, with current taxation levels. America became the wealthiest country on earth by having a growth rate substantially above world average for a protracted period of time. That is how American middle class prosperity came to sit on top of the world. That higher American growth happened in a world where average growth rates were much lower than they are today. Now the world has irreversibly changed. While 2% growth might have been stellar by world standards at the beginning of the twentieth century, these days, the world has entered a new era of irreversible faster growth. The new bar for simply MAINTAINING your prosperity status in the world is a three to four percent growth trendline. Under this backdrop, the American middle class is careening into increasing taxes on itself!! Whether it’s through energy taxes, income taxes, payroll taxes, excise taxes, import tariffs etc. does not matter. The effort -reward curve flattens. The effort-reward curve flattens as the state grows to tax citizens more and hand out unconditional mediocre services. You get less and less for any additional effort you put into your work, education, career. That is, the marginal reward for exceptionalism decreases. You become less enthusiastic, you become Europe. Though, as I said, America need not become Europe to decline. At the current two percent growth trendline, half the world average, America is already on a steep trajectory to decline, a trajectory of decline — becoming absorbed into the middle income country group, albeit just a little slower than Europe is. America will have gone from top prosperity ranking to middle income status in less than 3/4 of a century. This may seem a long process in daily life — but it will be logged in the history books as an unprecedentedly fast peacetime decline. Of course, other countries will experience this fast decline (and other countries will experience fast ascent) in this century. The pace of world change has irreversibly accelerated. Ascents and declines that used to take centuries will now conclude in mere decades — and the trend is poised to accelerate even further as time goes on. Bury it in your mind, dear Americans, that this is the world you will live in. Refuse to accept it? Find European statism more attractive? You’ll be left in the dust in no time! “Marginal enthusiasm to excel” : that is what will distinguish the prosperous nations of the future from the sinking laggards. Does your nation have it? Or perhaps I’m just wrong. Perhaps people in your nation derive their enthusiasm from the opportunity to serve distant others under a bigger government — day in, day out, throughout life. Are there really such humans? Enough such humans to build a prosperous society? Hope that there may be dies last. Prosperity though dies first. B) even though this capitalist system has propelled me into the world’s top 3%, as a member of the American middle class, those richer folk still live better than I do and I just can’t get over it. I have to live on the same street as the richer folk with the better homes and I just can’t stand seeing it every day. C) So what if these folk add higher value to production compared to me? They may produce ten times more but I don’t want reward to be proportional to production. If they produce four times more they should just earn twice as much as I do. Eight times more, then a 4x compensation multiplier. That is what I’ll vote for. Why? Because I can! Our rich people will always outcompete the most competent people in other nations, won’t they?